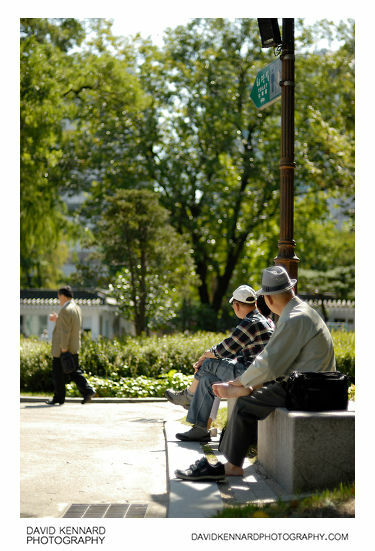 After buying some doughnuts and coffee from a nearby Dunkin' Donuts shop, we went to Tapgol Park, which is located across a road at the bottom of Insadong-gil. 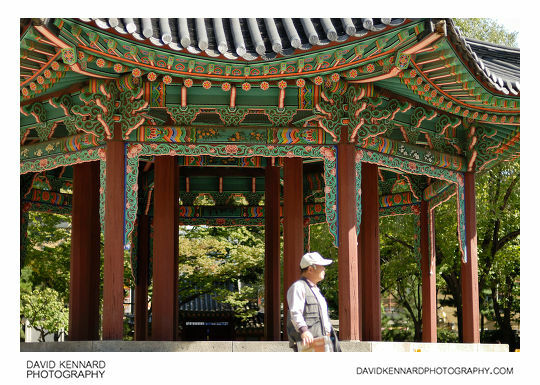 In the middle of Tapgol park is this nice Palgakjeong (8 sided pavilion), which was built in 1902. When we were there it was cordoned off, I'm not sure why though. 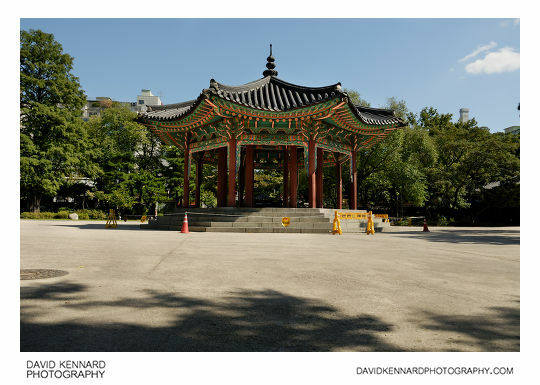 The pavilion is famous for being the place where the Korean declaration of Independence was read in 1919, when Korea was under Japanese rule. This was the start of a national movement for Korean independence, and there are lots of monuments in Tapgol park in rememberance of this period. Round the edge of the park are large concrete blocks that can be used as seats. This is a closer view of the pavilion, though I was actually trying to focus on the man in front the pavilion. I took a panorama of the park where we sat to eat out doughnuts and drink our coffee. 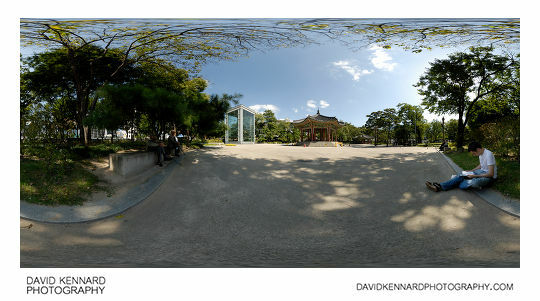 You can see the 360° VR version here: Tapgol Park 360 VR. From here you can see the 10 storey pagoda enclosure and the pavilion. 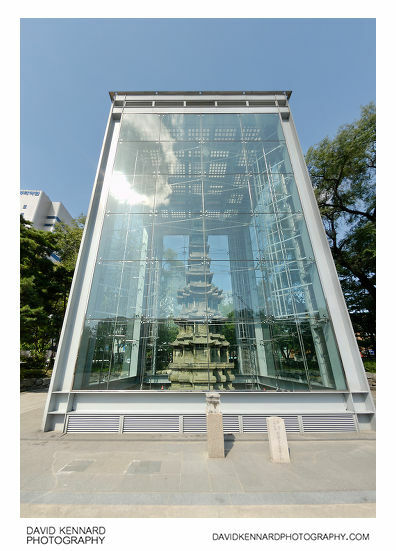 Here's a closer view of the enclosure built around the Ten storey stone pagoda. This photo was taken with my fisheye lens. I then defished it to rectilinear projection, which I think emphasises the height of the structure better than the fisheye projection. And this one was taken with my standard 18-70mm lens. Unfortunately the large enclosure makes it hard to get a good photo of the pagoda, but I presume it keeps it safe. The pagoda was built in 1467 and is one of only two items left from Wongaksa temple, which used to stand on the site of Tapgol park. 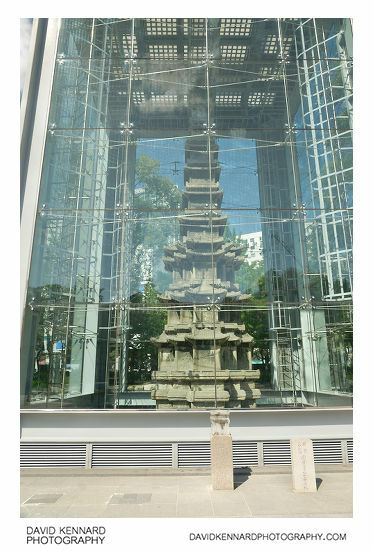 The pagoda was the second item to be designated as a National Treasure by the Korean government in 1962.